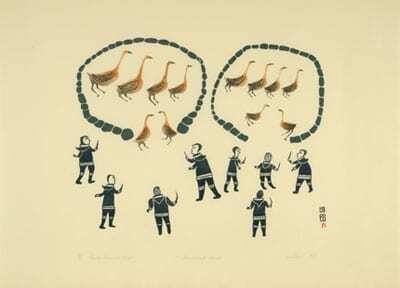 2012 Spring Collection: In this 1964 stonecut & stencil by Kiakshuk, eight Inuit, cloaked in amauti (parkas), have successfully rounded up twelve geese into stone pens. The composition is lively, which just enough color in the geese to prevent it from being monochromatic. This first generation Cape Dorset artist was succeeded in the Cape Dorset art scene by his son Lukta, whose sons Qiatsuk and Palaya continue to have successful careers. The fourth generation is already showing signs of talent in carving as well. Stonecut & Stencil; 1964, edition of 50.